Following last week's AEW Double or Nothing rally, The Young Bucks, Cody & Brandi Rhodes, and Hangman Page all showed up at Bar Wrestling's show in Los Angeles, California on Wednesday night. 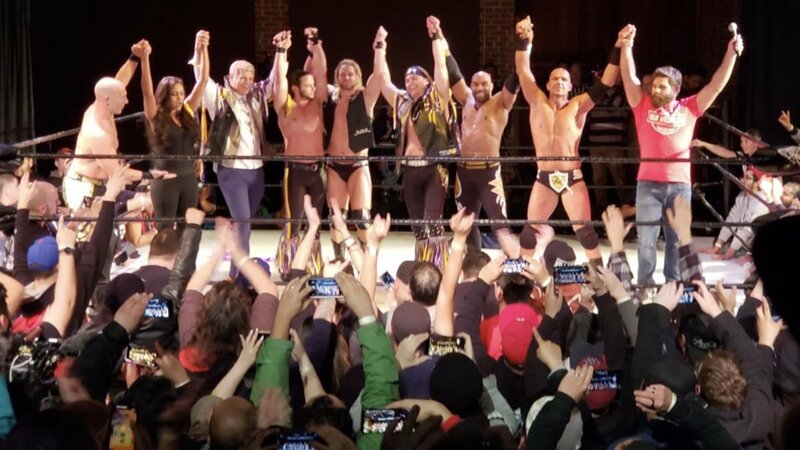 The event was headlined by fellow AEW wrestlers SoCal Uncensored (Christopher Daniels, Frankie Kazarian & Scorpio Sky) facing the RockNES Monsters (Johnny Yuma & Kevin Martenson) & Eric Watts in a six-man tag match. The match led to an angle where Joey Ryan stopped Watts from hitting Sky with a chair, and Page, Cody & Brandi, and The Young Bucks all ended up making saves. Referee Rick Knox counted the pin for SCU after they hit the Best Meltzer Ever. Page made a save for Ryan, with them teaming up and shaking hands after the storyline on Being the Elite where Page "murdered" Ryan. SCU, Cody & Brandi, The Young Bucks, Page, and Ryan stayed in the ring after the main event, with Kazarian closing the show by leading the crowd in an "SCU" chant. The Elite appearing at Bar Wrestling had been teased on Twitter prior to the show.